Hypnotherapy training blog for practitioners and students: hypnotherapy news, hypnosis tips, therapy techniques, therapy articles, client skills, business building for therapists. All here and all free to access. Online magazine for hypnotherapists and hypnotherapy students, hypnotherapy training blog, business building and client tips. 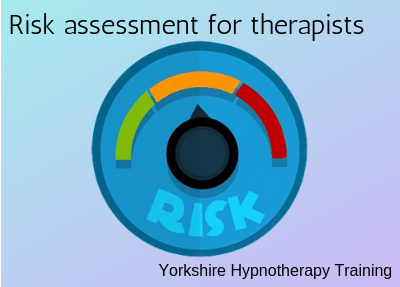 Any business with five or more employees must, by law, have a written risk assessment, but most therapy businesses are smaller. Despite the fact that it’s not a legal requirement, it can be a good idea to have a written risk assessment as part of your ethical or ‘best practice’ approach to running your business. What is a risk assessment?A risk assessment is just what it says. It’s a check for what might put you – or your clients – at risk of harm, and a plan to remove that risk, or at least reduce it as much as possible. 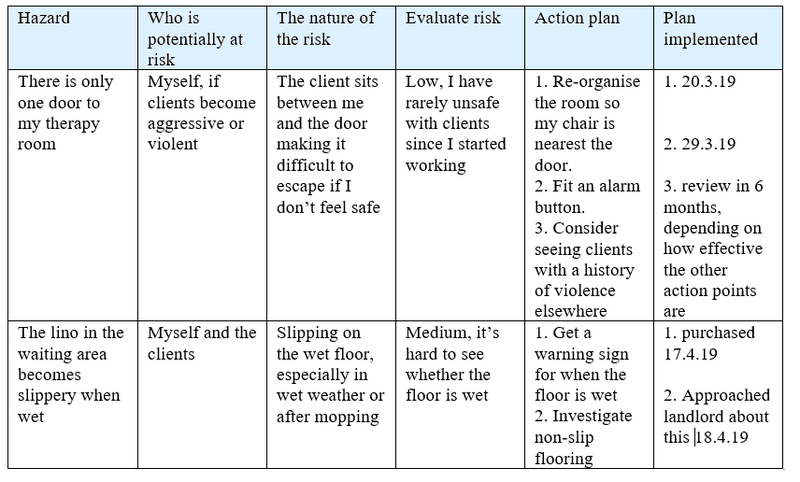 What to put in a risk assessmentWhat hazards exist in your workplace will vary, depending on where you work and the type of client you work with. Here are a few questions to help you identify some of them, but you can probably think of others. Is the client contraindicated for your therapy? Are they classed as ‘vulnerable’ and if so, what steps do you need to take to safeguard them? Do they have psychological or physical health problems that might impact on the therapy in some way? What would you do if the client identified a ‘duty of care’ issue such as child endangerment, self-harm or suicidal thoughts? If you use products such as aromatherapy oils, do you check for allergies? You may well ask many of these questions in your intake, without necessarily using the term ‘risk assessment’ to describe it, but thinking about it in these terms can be helpful to reduce the risk. Do you publish your full address online? Do you have photos of family around in your therapy room or valuables on show? What would you do if a client’s behaviour made you feel unsafe? If there is only one exit, who sits nearest to it – you or your client? Do you have an emergency contact if the client is taken ill? Are you at risk of allegations about unethical behaviour? Do you screen clients before a first session, or can anyone use an automated booking system without contacting you? Do you have adequate supervision and self-care arrangements to help you deal with upsetting or distressing stories? Do you make it clear how (and how often) you can be contacted between sessions? Do you have adequate and appropriate insurance in place? Is all flooring free from tears, holes and trip/slip hazards? Is all electrical equipment PAT tested regularly to ensure it’s safe? Could some clients have difficulties in accessing your therapy room or the toilets (e.g. stairs)? Column five: what can you do to remove or reduce the risk of that harm? Now you have a risk assessment …All you have to do is put your action points in place and review it from time to time. This last is essential because things change, for example, a carpet which is fine now, might develop a tear in a few months and create a new opportunity for someone to get hurt. If you have enjoyed this article, please use the share buttons on the grey bar (below the author details) to share it with others who might enjoy it too. Thank you. Author: Debbie Waller is an experienced hypnotherapist and hypnotherapy trainer. She is the author of Their Worlds, Your Words and has co-written the Hypnotherapy Handbook, both of which are available from Amazon. 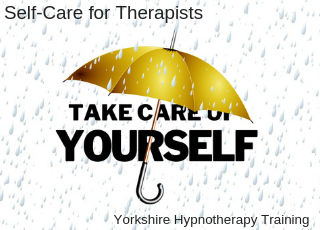 Yorkshire Hypnotherapy Training - multi-accredited hypnotherapy practitioner training, taster days and foundation levels. Does the idea of blogging make you throw up your hands in horror? Here’s our handy guide, with therapists in mind. As small business owners,we are often told that blogging is good. But what is a blog? And why should we bother? 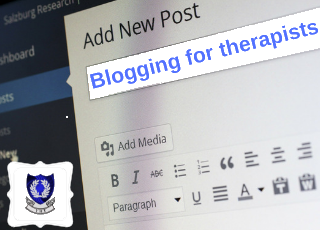 The term blog comes from ‘web log’. They were originally a sort of online diary, with brief entries telling people what you (or your business) were getting up to today. These days, that sort of post seems to be used more in social media, and blogs have become more like a library of articles. So, broadly, a blog is an article. Search engines tend to ‘like’ websites that are regularly updated and often list them higher in search results. Adding a blog on a regular basis proves to them you are actively promoting your business. It’s a useful source of content for your social media pages, newsletters etc. If other people like or share your links it helps to spread the word about your business. It demonstrates you know what you are talking about, and helps connect you with other therapists who see these links; they can form a support or referral network. It helps to connect you with potential clients – if you’re offering free tips and advice, via your blog, they begin to build a relationship with you which might encourage them to pick up the phone for an appointment. You can test what your audience likes to hear about then recycle or re-purpose your most popular blogs – turn them into ebooks, leaflets, articles for publications, courses, or books. Lists, in particular, can be converted into social media image posts, with one tip on each image. How much should you write?Historically, as we’ve said above, blogs were short – often 200 to 250 words. Conventional online wisdom also says that visitor attention span is brief and we should keep word length down to a minimum, but according to some research, the changed way that blogs are used means things might not be quite so simple. Search engines like longer pages, the average number of words on a page that comes up on page one for a google search is around 1900. Articles over 1000 words get more shares on social media than shorter ones. Human visitors to your website like posts that take about seven minutes to read (usually around 1600 words). The optimal word length for healthcare topics is around 2000 words. From all this, we’d say between 1000 and 2000 words might be a good target for therapists. How often should you write?Many sites on blogging tell you to post at least once a day. As a sole trader who has to do everything for your business from washing the floors to seeing the clients, it may well be impossible for you to do this. And it’s obviously quicker and easier to write 200 words than 2000, so how often you write may also depend on what (or how much) you’re writing. Our advice is to write when you can, but make it regular. Even if daily or weekly blogs are the gold standard, common sense implies that blogging once a month seems better than not doing it at all. Set time aside every so often, write a number of blogs and schedule them to appear on a regular basis. Don’t just blog about what you do. By all means, include a quick plug for your services, but no-one will read a 2000 word advert! Cover less directly related topics as well as the specific areas you work in. So, if you work with people suffering from anxiety and stress, talking about improving happiness or satisfaction with life is likely to attract their attention. This has the added benefit of allowing you to write about positive feelings, thoughts and habits, where your sales pages might focus more on the issues and problems faced by your clients. ‘Listicles’ are very popular; titles like ‘7 tips to …’ or ’10 things to avoid when …’. Mix these in with longer, factually-based pieces to give audiences some variety, then keep an eye on which approach gets the most hits. Adapt your approach over time to suit your audience. How to write a blogEveryone writes differently but here’s my process to get you going. If you use Facebook or other social media, you might get ideas about what to write from questions posted on groups you belong to. Especially if a similar question is posted a few times by different people. Think about what your clients most often ask you – answer that. What about the news? Has someone from Strictly recently admitted to having hypnotherapy for stage fright? Write an article on performance anxiety and refer back to the news article. It’s a really bad idea to copy other people’s blogs. Not only does Google penalise duplicate content on your website but it’s a breach of the original author’s copyright. However, looking at what others have said about your topic might give you an idea of your ‘angle’ – how to approach it. Get something down on paper (or more likely, a screen). Brainstorm ideas, putting down even the silly ones. Notes, words, phrases, slang, whatever comes to mind. Then start to organise it into some sort of logical progression. Spell and grammar check – twice! If this aspect of writing is not your forte, get someone else to read it as well. I find reading the article aloud is a really good way of checking that the words, sentence length etc work well. Images are important, to catch people’s attention, but always ensure they are royalty-free, or you’ve taken them yourself. I pick my title at this point, so it really reflects what is in the article. You’re now ready for publication: press the publish button and go! Author: Debbie Waller is an experienced hypnotherapist and hypnotherapy trainer. She is the author of Their Worlds, Your Words and has co-written the Hypnotherapy Handbook,both of which are available from Amazon. 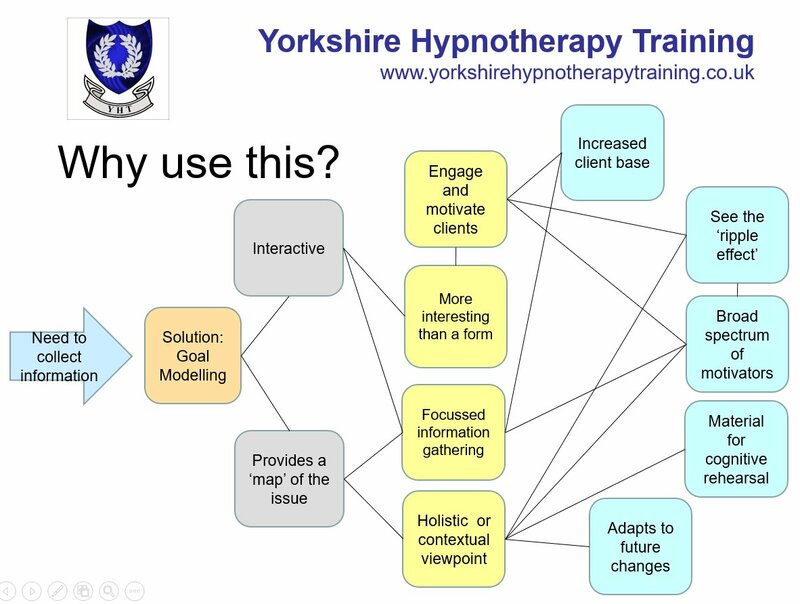 Yorkshire Hypnotherapy Training - multi accredited hypnotherapy practitioner training, taster days and foundation levels. Born David Kopelman, son of Jacob and Lena, on May 6th1900, Dave Elman was raised in Fargo, North Dakota, as one of a large family. Jacob ran a business making wigs and theatre equipment, which likely gave David a good knowledge base for his later performance career. When David was very young, his father Jacob was diagnosed with terminal cancer, and as it progressed it caused him severe pain, which traditional medicine failed to treat. A family friend happened to be trained in stage hypnosis and was able to relieve Jacob’s pain with only a few minutes of trance. David saw how effective it was, and became fascinated with hypnosis as a treatment. Jacob died when David was eight, leaving Lena with six children and one more on the way. With little governmental social support existing in 1908, David had to start work very early to help support the family. He worked various jobs in his early teensbut soon found he had the most success in performing as a musician (specialising in saxophone and violin), comedian, and stage hypnotist in Vaudeville. In 1922, David arrived in New York under the name he became better known by later, Dave Elman. Anglicised stage names are often used so an English-speaking audience can remember them more easily, but the reason he always gave was so it could be printed in bigger letters on posters and marquees with limited space! Stage acts require very quick results to keep the audience interested, so Elman developed induction methods which could put a person in trance in mere seconds, and soon became well-known as 'The World’s Youngest and Fastest Hypnotist'. Elman later moved into writing and producing music, working with famous blues musician W. C. Handy to write songs such as the famous 'Atlanta Blues'. Around this time he met his future wife, Pauline Reffe. In 1928 he started working in network radio in New York, where he wrote, directed, produced, and performed in various shows for and with celebrities such as the singer Kate Smith. 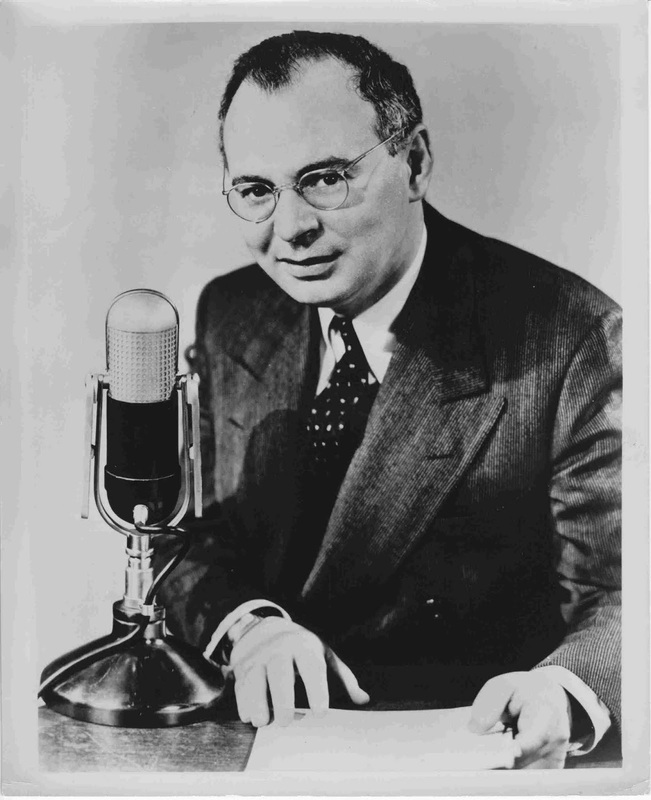 In 1937, Elman began a new NBC radio show named Hobby Lobby, in which ordinary people would become advocates about their unusual hobbies. The show was a runaway success, and ran coast to coast for over a decade; it was so famous, in fact, that First Lady Eleanor Roosevelt stood in as host when Elman was unavailable, twice! During WW2 she and Elman advocated therapeutic hobbies for soldiers, and he raised money for the war effort by auctioning war bonds. In 1948, Elman organised a charity show, but the top-billing act had to drop out. Unable to find a replacement, Elman went on himself and performed his old hypnosis tricks. The show went well and, afterwards, Elman was approached by a doctor who had been in the audience, who asked Elman to teach him how to use hypnosis for medical treatment. Elman developed a training course in what he called Medical Relaxation. At first, he taught a team of fifteen doctors, but he received many requests from other medical professionals, and so he spent the next thirteen years travelling throughout America, teaching his course to doctors, dentists, and therapists. He also published it as a set of audio recordings to spread it even further, along with a set of recordings of actual hypnosis sessions entitled 'Hypno-Analysis'. After a long illness in 1963, he decided to write a book. His wife Pauline took dictation for a living, and so was able to type out the book for him; their son Robert was an editor and so took on that part of the work. The result was a 336-page self-published book entitled 'Findings in Hypnosis', which is still widely used, although it was retitled 'Hypnotherapy' in 1978. Elman died a few years later, on 5thDecember 1967. His record for the numberof people taught how to use hypnosis still has not been beaten. Elman listed three required points for hypnosis. First, the subject must be willing; second, the hypnotist and the subject must communicate well; third, the subject must trust the hypnotist. All successful hypnosis methods take these into account. He also found five common signs of trance. First, warm hands show the client is comfortable and relaxed, and likely to be easy to hypnotise. Next, when entering trance, the eyelids flutter, the eye whites turn pink or reddish, and the eyes water (Elman suggested this was because the tear ducts relax). Finally, the eyes roll upward. Elman created multiple methods, but his most commonly used method consists of several stages. First, the subject is instructed to close their eyes, breathe deeply, and relax. The hypnotist will then talk them through feeling their arms become heavy, opening and closing their eyes until they feel unable to open them again, and counting down from one hundred. Altogether, it can take less than four minutes. Dave called it the 3-minute routine or ‘3 trips to Bernheim’. Today this process is commonly known as the Dave Elman Induction. Elman’s hypnosis method is especially good for medical use for multiple reasons. First, it’s very quick, so not only can it be used in busy settings like hospitals, but new learners of the method can see results and know that it works straight away. Also, a short method can be remembered more easily and repeated consistently. Second, it works for over eighty-five per cent of subjects, including those who can’t be hypnotised by conventional slow inductions. Third, it allows the hypnotist to test repeatedly whether the subject is in trance yet, so it’s easy to tell if it’s working. Author of this article: Rachel Waller. Thanks to Cheryl Elman for her support: the image of Dave Elman is a radio publicity shot taken circa 1937-41 and is included with her permission. 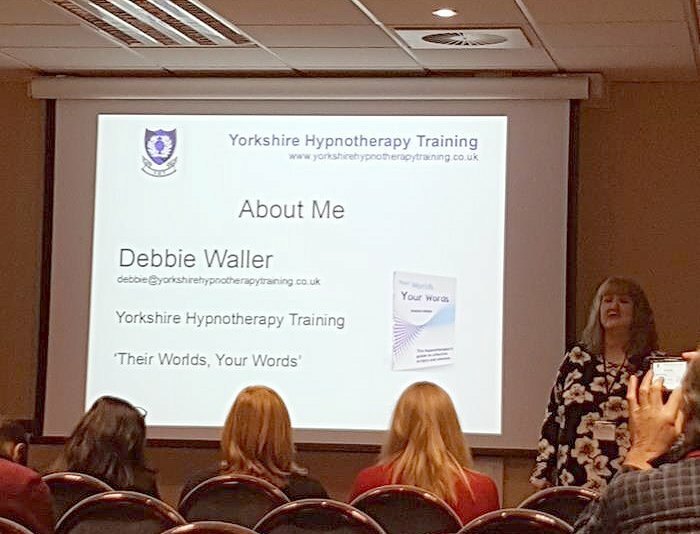 The editor of the Hypnotherapy Training & Practitioner online magazine, Debbie Waller, is an experienced hypnotherapist and hypnotherapy trainer. She is the author of Their Worlds, Your Words and has co-written the Hypnotherapy Handbook,both of which are available from Amazon. Should therapists publish their prices? Let’s start with the obvious; along with ‘Will it work?’, price is one of the things that every therapy client wants to know. 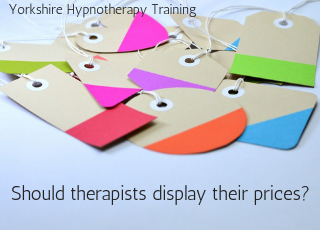 Many of them have not used a therapist before and have no clue whether your prices are nearer £5 or £500. A lot of businesses consider it essential to put their prices online and when you’re selling a product like shoes or tins of peas this seems very sensible. Imagine buying from a site like Amazon or eBay if they removed their prices. But when you’re selling a service, like therapy, it’s not just about cost, it’s about value as well. You might feel that publishing prices doesn’t allow you to demonstrate that value. So how do we resolve the question posed in this article? Other local therapists (i.e. your competition) might see them and undercut you. ‘Sticker shock’ – the client may see the price and decide it’s too expensive without considering value. Your prices might vary depending on what the client needs. It encourages ‘value conversations’ – people who are interested in what you offer will call, and you can help them see the benefits they’ll gain as well as the cost in pounds. You might prefer to let clients who are primarily price-oriented go elsewhere. It reassures clients who might assume you are more expensive than you are. It gives transparency and allows potential clients to make informed choices. It reduces the number of enquiries you get, leading to a reduction in the time you spend on the phone or answering emails. There are SEO (search engine optimisation) benefits - if someone Googles ‘price of hypnotherapy’ and you’re the only one in your area displaying them, they’ll likely see you first. If you’re the only one who doesn’t include prices, they may not see you at all. How to decide whether to publish your pricesIn the end, the choice is yours, but remember that many of your clients have a finite amount of income. However well they understand the value of what you are offering, your price is likely to be a consideration. Just a personal aside here. I have never really gone along with that idea that says, ‘If you make them want it enough, they’ll find the money’ and it really annoys me if I email someone enquiring about prices and get back a blurb about how wonderful their staff or services are, with no price included. You have plenty of clients and would prefer to spend more time seeing them and less on answering queries. You have a website which is crammed with information that makes the value of your service obvious. Your services are well-defined and contained; for example, you have a set price per session or package. You would like more clients, and want to encourage people to call you. You are a good sales-person and enjoy talking to people about the value of your services. You have a high conversion rate from calls. Your prices vary (although you could include a guide, perhaps with anonymised case studies illustrating the top and bottom of your range). So - to publish prices or not? Let me know below whether you have your prices on your website, and why you made that decision. You might wonder why therapists need tips about self-care. After all, we’re supposed to know all about coping with stress, to have lots of techniques at our fingertips, and (most of all) to have a dream job helping others which is fulfilling and satisfying. All that might be true, but therapists can be tempted to put other people’s needs before their own, and sometimes they need to stop and take stock. After all, as every airline tells you, you put your own oxygen mask on first so you are in a fit state to help others. Why therapists need self-careJohn Duffy, PhD, a clinical psychologist and author of The Available Parent: Radical Optimism for Raising Teens and Tweens, defined self-care as “attending to your own needs such that you are content, focused, motivated, and ‘on your game.’” That goes for therapists as well as parents. Therapists can care just too much, (see my other blog on ‘why your empathy can get you down’) and are at risk of ‘burnout’ which basically means you are so overloaded emotionally you simply can’t cope any more. At the other end of the scale, they can cope by compartmentalising so much that they don’t empathise with clients at all. As in any job dealing with people in distress, a bit of detachment is necessary so you don’t get so caught up in your client’s point of view that you can’t help them look at things differently. But too much is counter-productive. Self-care helps you avoid both of these extremes, staying empathetic and engaged without becoming overwhelmed. So here are our top tips. Accept that your self-care routines are as important as doing your accounts, seeing clients and answering the phone. Schedule time for them in your diary, and ditch any guilt or doubts about prioritising your own needs. Set specific hours during which you are available to clients, and be strict with yourself. Have a separate phone for work which you switch off every day, and if someone genuinely can’t attend during your usual client hours, consider adding an ‘out of hours’ fee to your usual price. Set clear boundaries. Let clients know under what circumstances, and how, they should contact you between therapy sessions. Needing to change or cancel an appointment is obviously OK, but daily updates, calls and questions (unless you have agreed to this as part of the therapy) are too much. If frequent between-session contact is part of your therapy, make sure you factor it in to your working hours (and hourly rates). Get a good supervisor or support group who can be there for you through your victories, moments of doubt and personal crises (we all have these, we’re people as well as therapists). I'm happy to recommend supervisors if you don't already have one. .
Get organised. Use time management protocols like this one so you know what you can realistically take on and what you should either hire someone else to do or turn down. Talking of which, outsource if you can, especially time-consuming jobs or the ones you don't enjoy. For example, when I went full time, I hired a cleaner. Two extra client hours per month - which I enjoy more than cleaning - pays her wage. Use relaxation techniques regularly. It’s always good to use the self-care methods you give your clients but, for some, it can overlap too closely with work. For example, I often find myself analysing someone's voice and delivery if I listen to a relaxation audio, although my clients love the ones I give them. If that's you as well, look for alternatives e.g. going for a massage if you’re a hypnotherapist. Quality of self-care can be more important than quantity. Ten minutes with a book, playing with your kids or dog, chatting to your partner or friends, watching 'mindless' TV, or walking around the block will boost your emotional batteries. If you worked for someone else you would have around four weeks holiday a year. Take holidays from your therapy too, and don’t answer work calls or emails while you are away. It’s what vacation responses and answer-phones are for. Since I’m writing in December, make it one of your New Year Resolutions to improve your self-care. If you’re reading this at any other time of year, pick a date and make a resolution anyway! How to improve your self-care routinesAs you probably tell your clients, it can be hard to make too many changes at once. Then you end up giving up the whole thing in disgust and not making any changes at all. Pick one of two of the ideas above and put them in place right now. Start with the easiest. Then, each month, add another or improve the ones you already have (e.g. number 8 - take fifteen minutes a day for yourself instead of ten) until you are confident you are taking care of yourself as well as you take care of your clients. Are SMART goals good enough? Many therapists are taught to work with SMART goals – in case you aren’t familiar with this, it’s a mnemonic and stands for Specific, Measurable, Achievable, Relevant and Time-limited. As far as therapists go, it’s a really good system which allows you to understand exactly where the therapy is going and to recognise when you get there. But as far as motivating clients goes, it can be a bit dry. A client’s goals should be something they really, really want (to quote the Spice Girls). After all, they have contacted you to make life better. And something like ‘I will reduce my average daily calorie intake by 10% this week by cutting out cake and beer’ is more like a statement of fact than anything terribly exciting. So, if SMART goals are good for us but not so much for our clients, how can we build exciting and relevant goals for our clients to work towards? How can we use these to motivate them, and help them understand the ripple effect where making one small change can reach into many areas of their lives? This is definitely true by the way. I once had a client who, six months after getting rid of a phobia had taken up golf, lost weight and re-decorated her home – all things on her ‘to do’ list for a long time. Dealing with one issue gave her the mental and physical energy to tackle the rest. I recently spoke at the 2018 UK Hypnosis Convention on this subject and showcased a protocol called Goal Modelling© which was developed by my husband and myself from a method used at Cranfield University to manage change within businesses. Now you might ask, 'Why is managing change within a business relevant to my clients?' Good question and I have an equally good answer (I hope). Dave and I realised some time ago that we actually do very similar work, although I may have the easier version of it. He helps large organisations implement change. Within that environment, change is often decided upon at the highest levels but implemented by those who are closer to the 'shop floor' - the customer-facing teams and their line managers. If they don’t see value in the changes, especially if they feel that change has been 'imposed' on them without much consultation, they tend not to be motivated to put the new ideas in place or make them work. This is where Dave comes in - he helps management to analyse if the changes are the right ones to make, and staff to understand why they will benefit by making it work. My clients come to me already motivated in many cases. 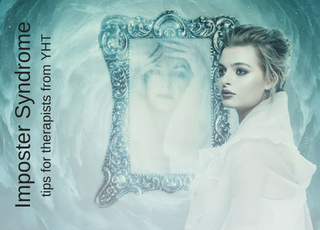 In fact, many therapists would think twice before working with someone who says the only reason they want to change is that 'someone else decided I need to do this'. But even motivated clients benefit from understanding all the different effects the changes they’re implementing will have. The benefits – what the client actually gets out of the features and outcomes. The benefit means taking this even further and saying why is that a good thing? What will playing football with your kids do to make life better? Most likely the answer will be along the lines of ‘Our relationship will improve’ or ‘We’ll have more fun together’. That’s the benefit and that’s also the client’s real goal. Quitting is just the way he’s going to get it. So the SMART goal is your goal, as a therapist: it’s what you want to achieve within the therapy. Your client’s most compelling goals are the benefits he’ll get after that. 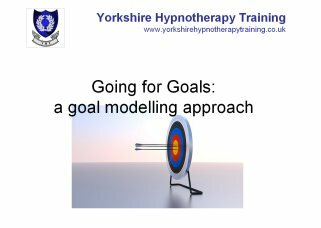 Goal Modelling can help you identify the client's most desirable outcomes, and will also give you lots of information on which to base very compelling suggestions for your session. So both you and the client benefit. If you are interested in learning more about this approach, there will be a CPD workshop available from 2019. In the meantime, I am happy to come and talk to peer support or supervision groups, schools etc. You can email me at debbie@cpd.expert to find out more. 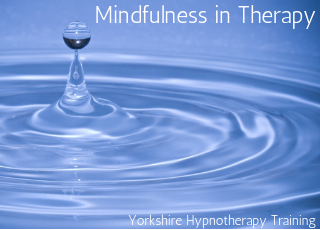 Whatever kind of therapy you offer your clients, it would be hard not to be aware of mindfulness which has become a popular intervention in pretty much every well-being approach. So what’s all the fuss about, and should you be using it with your clients? What is mindfulness?Mindfulness is about being ‘present’ – aware and non-judgementally focussed on what is happening in the moment. It arose from Hindu and Buddhist spiritual practices, but over time has become secularised and separated from them so that it is acceptable to those who follow other religions, or none at all. In fact, part of its appeal to some people is that it can be used as a practical stress management tool without carrying any of the emotional or spiritual ‘baggage’ often attributed to meditation and even self-hypnosis. Mindfulness is now so popular it has become big business – the Global Wellness Institute values the industry at $3.72trillion and the top mindfulness app, Headspace, has been downloaded more than eleven million times, giving it an annual revenue of £50million. MBSR has also been used to improve chronic pain and fatigue, depression, anxiety, life-stress, psoriasis, cancer, executive control (problem-solving skills), weight loss, and smoking cessation results. There is evidence to suggest that therapists can benefit from using mindfulness as well as their clients. You can probably guess at most of the benefits, such as avoiding stress and burnout, and increasing concentration, compassion and empathy. But there are also specific benefits, such as being able to listen to clients mindfully or coping with your own reactions if your client is describing something emotional or distressing; some research even shows that therapists who practice mindfulness are rated more highly than those who don’t for warmth or understanding. Mindfulness and therapy: how can mindfulness help my clients? Mindfulness training talks about the difference between ‘mindless’ and ‘mindful’ behaviours. When you are acting ‘mindlessly’ you are not really paying attention. Think about driving, for example, and how easy it can be to take a wrong turn because it’s the way you usually go. You can experience automatic negative thoughts and feelings like this too. The opposite of this is to act ‘mindfully’, becoming aware of our reactions as they happen, so we can learn to accept or control them, or choose to react differently. By immersing themselves entirely in the process of snacking, clients will tend to be more aware of how much they have eaten, and when they are full, leading to a reduction in overall intake. Similar approaches can be used for cravings of all kinds – the best-known approach is RAIN (Relax into the feeling, Allow it to be there, Investigate bodily sensations, Note what is happening from moment to moment). Would you like to know more?There is plenty of information online, but if you would like to have it conveniently in one place, we offer an accredited (level 2) home-study course on Mindfulness for Therapists, suitable for talking therapists of all kinds. This includes links to hundreds of interventions you can use with your clients. You can find out more about the course HERE. Have you ever driven past a new housing estate with a big sign that says ‘If you lived here, you’d be home by now’? Starting therapy is a bit like that. Most clients who come to see me have had their problem for some time. They’ve lived with it, or around it, or just avoided whatever situation made it worse. To re-frame the sign, if they’d had therapy a year ago, they’d have solved it by now. So what stopped them? Fear of changeIt’s well known, among those that deal with stress, that change can be stressful whether it’s perceived as a positive or a negative event. Moving house is widely accepted as one of the most stressful things you can do, and it often doesn’t matter whether you’re going from a hovel to a palace or the other way around. It’s the process of change itself that people find difficult. 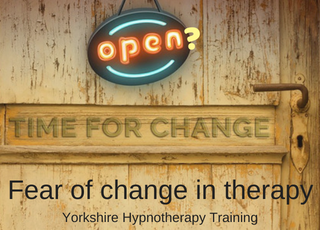 Why is the prospect of change difficult?Therapy is all about change - it’s why our clients come to see us. So what is it about change that could also be inhibiting the results, or even stopping them from contacting you in the first place? The risk of failure. What if the therapy doesn’t work? Say they come to a therapist to quit smoking, and then they don’t quit? What will their family and friends say? What about the time and money they invested? Maybe it’s easier not to try. They don’t feel strong enough. If your client suffers anxiety or depression, in particular, they often also experience mental and physical fatigue. Doing anything new is difficult because the ‘thinking parts’ of the brain which deal with language, planning and memory are adversely affected as well, so the prospect of changing long-term habits feels like too much effort. Fear of what’s involved. People worry about what the therapy will ask of them emotionally and practically, and what they will have to face. Some assume they will have to reveal - or discover – hidden trauma that they might have preferred to remain hidden. Fear of success. If you have a flying phobia, for example, you know if the therapy is successful your family will want you to go on holiday with them. So if the therapy is successful you'll have to do the very thing you've been avoiding all these years, which is a scary prospect. Wondering if it’s worth it. If your client has never been, confident, slim or a non-smoker they may wonder if it’s worth the effort to achieve their goal. They struggle to imagine life the way they'd like it, and the status quo is familiar even if it’s not particularly comfortable. Fear of other people’s attitudes. If people find out you’re having therapy, will they think you’re ‘weird’, ‘crazy’, ‘weak’ or even ‘laughable’? If you’re overweight and want to trim down, for example, will you have to go to a gym class where everyone else is slim and will mock your lack of fitness? How can you help your clients deal with change?Am I blaming the client for their failures here? No, absolutely not. Some of the processes I’ve mentioned could be completely unconscious and the client may not be aware of them. Even where they are aware, your client has legitimate reasons for their fears. Some of those reasons might stop some people from signing up with you at all. That’s tricky to deal with because you don’t know who they are. But you can assume they exist and make sure that your website and other literature addresses their concerns. Offer plenty of information about how you work and what’s involved. Offer to answer questions or concerns without a ‘hard sell’. Stress that you offer a confidential service and that your therapy is client-led. Reassure people that life following therapy can be good, but at the same time be honest about whether you are the best person to help, and what the chances of success are. Once your clients actually become clients, it’s easier. Don’t ignore or dismiss the client’s concerns about change, talk about them openly and look for solutions within the therapy, even if you feel you’ve been ‘side-tracked’ from the original problem for a while. Emphasise that they’re choosing change to make life better, not because there is something intrinsically wrong with them. Set reasonable and realistic goals in terms of achievement and time frame. Make sure you know why the client wants to change, and how exactly what they think this will do for them. Keep them focussed on those positive outcomes. Don’t expect change to happen at the same speed for each client – work at a rate the client is comfortable with. Chunk down the goals into smaller steps if that’s easier, and build in rewards for each step the client succeeds in taking. Ensure that you work with the client’s likes and dislikes as much as possible – if your weight loss client dreads going to the gym, for example, find something else to keep them active. Planning is fine, but it needs to be mixed with a certain amount of flexibility - treat every client as an individual. If things aren’t going to plan, discuss this with the client. Why do they think this is? What is getting in the way of progress - and what would help them overcome it? Consider including some work on confidence, especially around dealing with change, in your therapy, no matter what the presenting problem is. Imposter Syndrome is not really a syndrome at all because it’s not recognised by the medical profession as a psychiatric disorder, but it is a term in fairly common use, and can be associated with stress, anxiety, depression and low self-esteem, so it’s relevant to us as therapists if we’re seeing clients with those issues. So if Imposter Syndrome doesn’t exist, what is it?Imposter Syndrome is frequently found in ‘high flyers’ and high achievers – those who have done really well in life and shouldn’t, at least on the face of things, have cause to doubt themselves. Despite very real evidence that they are successful, those with imposter syndrome will feel inadequate and insecure. These feelings lead them to worry that, somehow, their success is not real, but the result of luck or coincidence, and that therefore the credit given to them by others is undeserved. Some people feel that, through this luck or coincidence, they have inadvertently deceived others into thinking that they are better at life than they are. All live in constant dread that one day ‘the truth will out’ and they’ll be discovered and shunned by friends, relatives or colleagues who will realise that the whole façade was a fraud. The Perfectionist, who sets excessively high goals for themselves, then worry if they don’t achieve them – they are rarely happy with success because they always believe they could have done better. The Rugged Individualist, who feels that asking for help indicates weakness, so they have to achieve everything alone. The Expert, who feels that because they are recognized as having some knowledge in an area, they should know everything about it. The expert will constantly attempt to shore up their knowledge base and is particularly vulnerable to the fear of ‘being found out’. Many writers see Imposter Syndrome as mostly based on work and career issues but it can also be about being a good parent, partner, sibling, son or daughter, or even a good person generally. You could also ask clients to complete it or, with a bit of research, construct your own questionnaire to give them. Effective steps to defeating Imposter SyndromeWhether you see Imposter Syndrome in yourself or your clients there are ways to combat it. Exactly how you work with this issue will depend on what type of therapies you offer – hypnotherapy, counselling, psychotherapy, or coaching for example. But I’ve included some ideas. What patterns do the doubts have – are they there all of the time, some of the time, only in specific circumstances? Do they get more or less intrusive at times? Use diaries, notebooks, or SUD scales with your clients to pin this down. What thoughts come with the doubts – be as specific as possible. Diaries or notebooks can be useful, and I like to ask ‘when you ‘hear’ those doubts in your head, do you recognize the voice that says them?’ If they do, it can give you ideas about where to take the therapy. And even if they don’t you can try asking the client to imagine it as another voice – one they couldn’t take seriously, like Donald Duck on helium gas. What feelings come with the doubts? Where are they in your body? What name would you put to those feelings – fear, doubt, sadness, anxiety, depression or something else? (I’ve suggested a few ideas here, as examples only. Use clean language with your clients to find out what it is for them.) You will have techniques of your own to deal with whatever feelings the client identifies. Identify what the cause of the doubts is. Be as specific as possible. Is it a comment someone made, a new job title – what thoughts are involved? Any therapy techniques you know for identifying the source of negative thinking will help here, including parts work or regression. Challenge the doubts using any techniques you would use with other types of anxiety or negative thinking. Help to identify and reduce whatever unreasonable demands the client is making on themselves, (it’s fine to shoot for excellence but perfect is rarely achievable), boost confidence and self-esteem, alleviate depression and anxiety. Help the client to focus on more positive thinking, and to recognize their own accomplishments. Point out that Imposter Syndrome is a sign of success – otherwise, they would have nothing to feel they have deceived people about. Ask them to make a list of five things they do well, or that they like about themselves, and start there. Young, Valerie. (2011). The Secret Thoughts of Successful Women: Why Capable People Suffer from the Impostor Syndrome and How to Thrive in Spite of It Crown Business: United States. I am sure that you regularly think about your clients and how to help them but do you ever think about 'customer care' in a more business-oriented sense? No? You are not alone. Google 'customer care for therapists' and most of the sites that come up are aimed at physical therapists rather than psychological ones. But we are business owners, and it's something we need to consider. So, with that in mind, I thought I would share a story about customer care. A story of customer careMy youngest daughter recently had a very unpleasant experience. She had been for a late evening gym session and, as she got changed, all the lights went out, leaving her in pitch blackness. Making her way out of the changing room, she discovered that all the staff had locked up and gone home. She tried the door, which set off the burglar alarm, but she couldn’t get out. The gym was inside a shopping complex, but no-one from security came to investigate the alarm. She had no phone signal to call us, and there was no note of the security office number anywhere on reception; she finally dialled 999 using the gym's desk phone. The Police rang the security office and eventually, the guard turned up to open the door; altogether, she was trapped for 20 minutes with the alarm blaring loudly the whole time. She put in a letter of complaint and received an offer of compensation - a few free personal trainer sessions - which she was happy to accept. Unfortunately, they never materialised. The trainer never got in touch as promised to arrange them, and they weren't added to her account so she could book them herself. After chasing them for a couple of months, she was forced to escalate things to Head Office and cancel her membership. So, an opportunity - and a previously happy customer - lost. What is customer care?This got me thinking a lot about customer service, which is not just about providing effective therapy, or even dealing with complaints – it’s also about looking after customers (clients) well so that complaints don’t arise in the first place. And that means the practicalities as well as the therapy. In my daughter's case, for example, a simple check by the last member of staff to leave (to make sure that everyone had gone) would have avoided the whole catastrophe. That was probably missed because it had started to snow, and no doubt those concerned were thinking about the weather, and their journey home. That's understandable, I suppose, but it shows how important a moment's inattention can be. And, while you might never have been careless enough to 'incarcerate' a client, what about those small checks that you can do before you part? Is your attention on the client that's still with you, or the next one? Or even on your journey home? Customer service tips for therapistsHere are my top tips to ensure your customers (clients) are happy with your service. 1. If you work with hypnosis, remember that immediately after trance clients may still be in a heightened state of suggestibility. It’s a good chance to get in a few waking suggestions or to summarise what you feel they’ve achieved this time. It can help to ensure that they leave you feeling amazing and looking forward to coming back. 2. Don’t let clients feel they are being rushed out of the door once they have paid! Asking if they have any questions or feedback on the session can alert you to any concerns they might have which can be rectified immediately if possible, or scheduled for discussion next time. It can be a daunting process, especially if you're newly qualified or dealing with an issue for the first time, but feedback - even of the negative variety - is part of the process. It's better to know if the client feels things are not going as planned, so you can adapt your approach. 3. 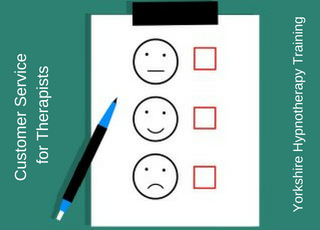 Give clients an opportunity to give feedback if they wish after the therapy is finished, perhaps through an online form. Make sure you read and respond to all feedback. Reach out and thank the client if it’s positive. If there are complaints or criticisms, respond without getting defensive. Consider if the comments are justified (especially if you get similar comments more than once). If they are, can you improve things next time, or for others? If not, ask the client to expand on what they’ve said, or give an example of what they mean. There may be a genuine misunderstanding you can clear up. 4. Be easy to contact, within reason. Most therapists work by themselves so being on call 24/7 isn’t healthy for you, or possible. But think about using automated responses on emails and social media, and a personalised voicemail message, so let clients know their message has been received and when they are likely to get a response. 5. Treat your client as you would like to be treated yourself, if your positions were reversed. I hope this helps you, and would love to know your top tips for customer care. Please post them in the comments box.